We did it! 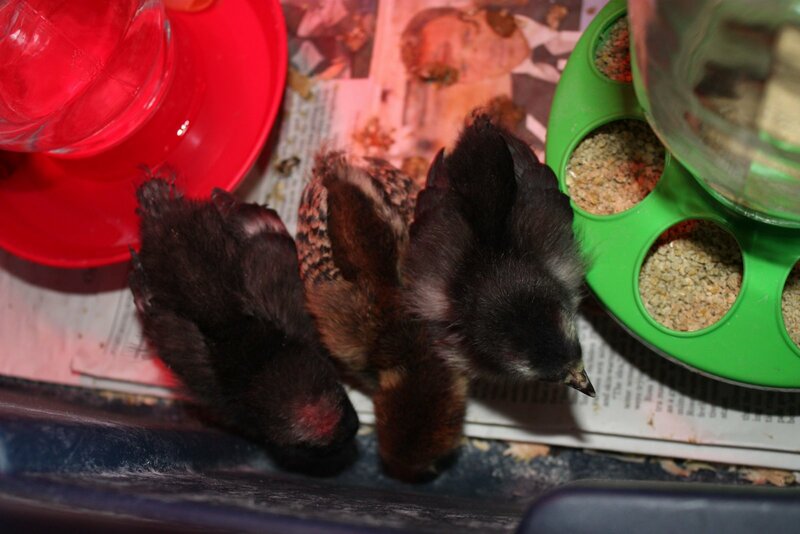 We got chickens!! 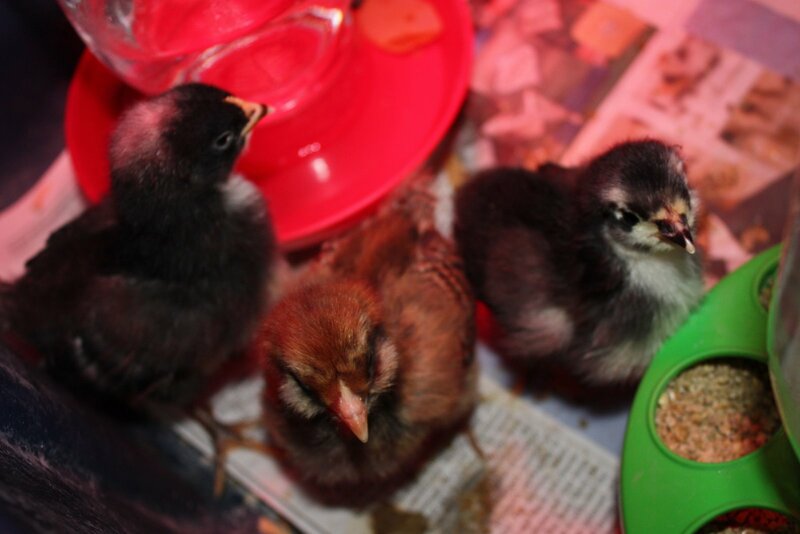 They are very small, very cute, and intermittently chirpy (when they are not falling asleep on each other). Scott found a chicken grower on Craigslist (Jean) who was producing chicks this month. On our way back from mountain biking in Winthrop this weekend we stopped by her farm in Carnation, WA, and brought home three little fluff balls, deciding not to wait until spring to start our wee flock. They have large feet and little beaks, long necks and little blunt featherlets starting to poke out near their butts where their tail feathers will be. They peck at the ground, and the walls, and occasionally each other. They preen their little fuzzy bodies. They dip their little beaks in the water then lift their head back to swallow. They stretch wee wings and try to fly. They are fun to watch. The largest chick is just starting to show a comb on her head at the top of her beak. The grower Jean painted the little tuft of her head pink to distinguish her from other little fuzzy black chicks. She is a Barred Rock breed, so we called her Rocky. We expect her to be a steady producer of brown eggs (~1/day). The smallest chick is also a dark little thing with yellow spots. 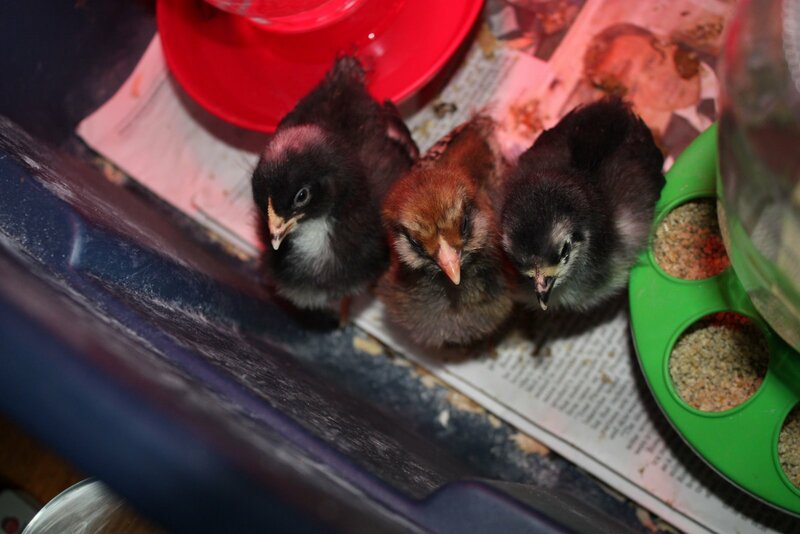 She is an Australorp, currently named Aussie, but probably not for long. She will also lay brown eggs when she gets older (probably in the spring). Our third wee chick, Greta la Gorda, is the most beautiful so far. She is brown with dark stripes on her wings and little puffy feathers on her cheeks. She is an Ameraucana – an American cross with Auracana chickens from Chile. She will lay pale blue eggs that we are much anticipating. So far it’s been super-easy. We keep them in a deep Tupperware with newspaper on the bottom that we change daily. I refresh their water in the morning, though I don’t have to. We’re feeding them a standard medicated feed until they get older. We pick them up several times a day and pet them so they get used to us. 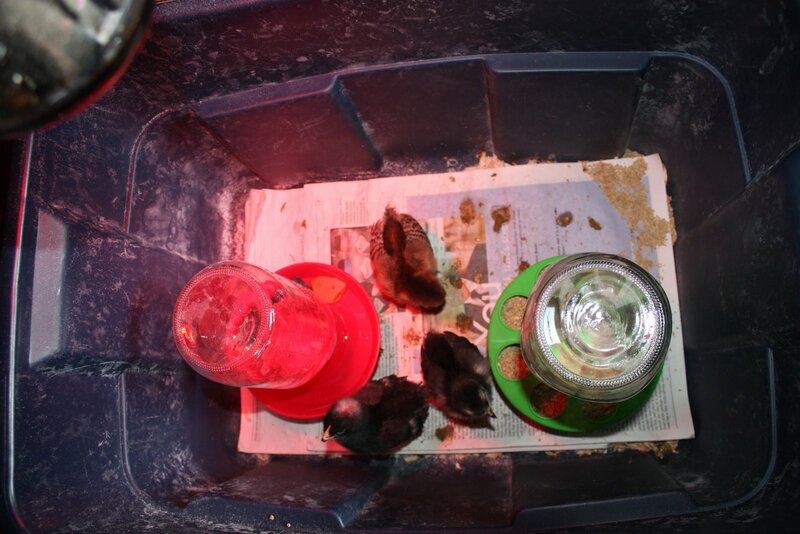 We borrowed a heat lamp from our friends Deborah and Walter Sepulveda who raised chickens this spring. We have to keep them near 90F and gradually bring the temperature down to ambient ~5F/day. We also bought some diatomaceous earth to sprinkle on them and on their bedding to prevent lice/mites. Love your chickens! I forget – how long do they give eggs for? Me too! They’ll lay eggs productively for 2 years, then increasingly less productively for another 1-2 years. Life span about 5 years.